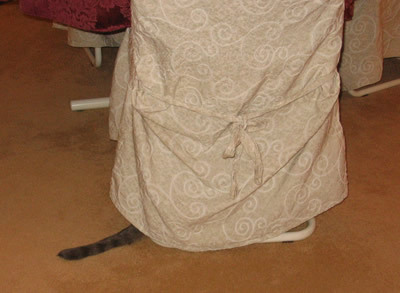 I awoke Sunday as normal, saw Clyde sleeping the back bedroom, and made my way downstairs for breakfast. These last few days, Clyde hasn’t been too interested in his normal breakfast routine, though he does eat when he finally makes his way out. So, it was just me walking around on the first floor when I came across an amazing sight. 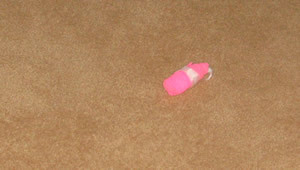 A pink bandage, lying in the middle of the family room. 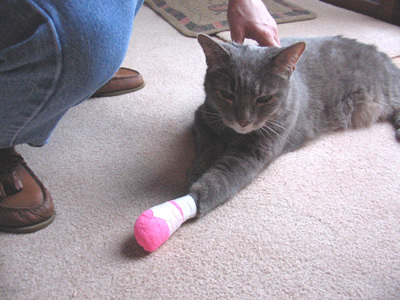 And so began our trying efforts to re-wrap Clyde’s foot again. It took Sue and me about an hour to get his foot appropriately wrapped before I headed off to do my radio show. I don’t know what possessed me to do this … but I thought we might be able to better wrap Clyde’s foot than we did in the morning. So … we unwrapped our work from the morning and proceeded to piss off Clyde to the nth degree. We spent a very exhausting 90 minutes trying to re-wrap Clyde’s foot … which ended in Clyde taking a big bite out of Sue’s arm. Obviously, we had annoyed him enough. I slapped the plastic collar around his neck and that’s how he spent the rest of the night. He was not pleased and proceeded to hide from us. We decided to take Clyde to the vet Monday morning to have his foot rewrapped. First thing Monday morning, we took Clyde to the vet for a rewrapping. Dr. Kelly said Clyde’s incision area was looking good, despite the exposure outside of the wrapping. We are to continue the medications, and bring him back Friday for another changing.